Why do we dream? Dreams allow our mind to resolve open thought loops from our day. Usually we dream in metaphors, which generally don’t make logical sense because they are a representation of our feelings. Many people look to their dreams for hints, clues and messages about their past, current, or future life. Dreams are directly related to an individuals imagination and it can be said that those with the wildest dreams have the wildest imaginations. There are many reasons this could be but it's important to remember that dreaming and imagining are a great way to relieve stress, improve memory retention, provide inspiration for creative work and even to provide insight into your life. Dreaming and diving into your imagination doesn't always have to be serious but it can be an enjoyable and fun experience. Unfortunately many people have trouble recalling their dreams. Thankfully through comedy hypnosis you can see other people’s imagination at play on stage. The benefits of hypnosis are countless and thanks to comedy hypnotists like Dizzy in Brisbane, it's possible to learn more about yourself than ever before while having an incredible time. 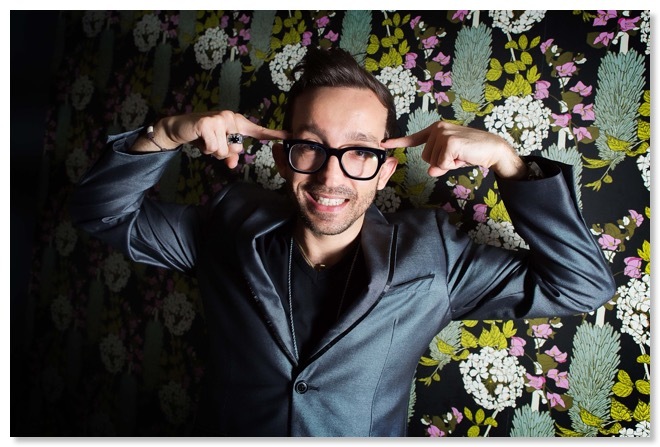 If you're looking to be entertained while discovering what's possible when it comes to your mind then a comedy hypnosis show is just what you need. By enabling people to realise that truly anything is possible, hypnotists like Dizzy are at the forefront of exploring your imagination. 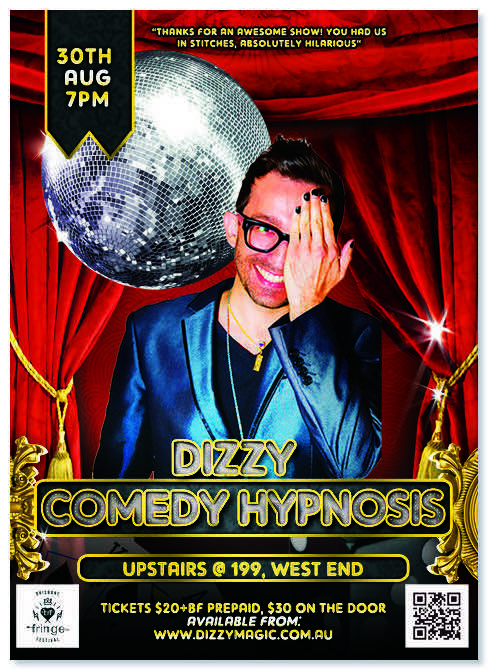 Whether you're looking to be completely entertained and have a good time or you simply want to learn more about yourself and what your mind is capable of then you need to check out Dizzy's Comedy Hypnosis Show. There are some things in this world that will always intrigue us. We will always want to know more about them, and gaze at them with wonder time and time again . . . because we simply do not understand them. Our human nature is to try to understand and explain everything that we see, but there are some things that just cannot be explained: and one of the best things that we can experience in this world that will shock us, make us laugh, and leave us with a smile on our faces is a comedy hypnosis show. Comedy hypnosis shows have come a very long way since the Victorian era, and my shows are definitely no exception. As a comedy hypnotist, it is my job to entertain you whilst demonstrating how amazing our minds really are. Who knew that words can lead them? Who could believe that someone could be encouraged to do such wild and ridiculous things? But you will see that and more at my comedy hypnosis show – more than you could ever have dreamed of. There will be some, of course, that argue that everything that occurs at one of my comedy hypnosis shows is a trick; and in a way, they are right. But I will not be tricking your eyes into seeing what is not there; instead, I shall be tricking people’s minds to make them believe absolutely anything is possible. If you believe that most of the people in my shows are plants, then why not come along for yourself and see with your very own eyes what wonders I and my wonderful audience can perform. No comedy hypnotist is the same, and I am certainly one of a kind. Why don’t you come along to one of my comedy hypnosis shows, and see what you make of me? How many years have you been practicing your art form? What prompted you to begin? I used to be a Magician. And found out about hypnosis through my magician friends. I was completely fascinated by it. I used to mix magic and hypnosis together in my shows. But now my shows are 100% hypnosis. Write a little about what you do. What's unique about it? I guess hypnosis in it's self is pretty unique. How many Hypnotists have you met in real life? But in saying that, I think the difference between me and other comedy hypnotists is that I don't want to humiliate people on the stage. I want people coming away with a positive experience if they volunteer. What can people expect from your BFF show or event? It's really two shows in one. If you volunteer I will take you through a whole range of positive emotions. And I might even introduce you to your favourite movie star. If you want to kick back and watch, I promise you will be completely amazed and laughing in hysterics. What is your opinion of the arts scene in Brisbane? There is so many talented artists in Brisbane. Every time I see a new show. I get inspired to become a better artist. Prince. I just love his music it just oozes sexiness. Name 3 things you'd need to be happy on deserted island. When I'm 80, I don't want to regret...not having left a legacy in my art form. I plan to pass on my knowledge to the next generation. So they can be better than I am. Name a local Brisbane artist you admire? Did anything hilarious or terrible happen during the show development? Tell us something about yourself or your work process that that would come as a surprise to those that know you. I do some self hypnosis before every show to remove any doubts about the success of the show.